Arthur Conan Doyle was initiated into the Phoenix Lodge, No. 257, at Southsea, Hampshire, on the 26th of January, 1887, and he made many literary references to Freemasonry in his work, especially in the Sherlock Holmes stories. According to Masonic scholar Yasha Beresiner, it was at the Phoenix Lodge that Conan Doyle met a certain Dr James Watson, who inspired the character of Dr Watson, the ever loyal companion of Sherlock Holmes. He also referred to Freemasonry in other Sherlock Holmes stories, such as The Adventure of the Norwood Builder (1903) in which Holmes referred to a character as a Freemason. In The Adventure of the Retired Colourman (1926), a character is described as wearing a Masonic pin, and in A Study in Scarlet (1887) a gold ring with a Masonic device is described. A Scandal in Bohemia (1891) has Holmes saying to Watson that ‘There is a wonderful sympathy and freemasonry among the horsey men. Be one of them, and you will know all that there is to know.’ The mention of Freemasonry in these stories added to the mysterious texture and gave an element of secrecy. 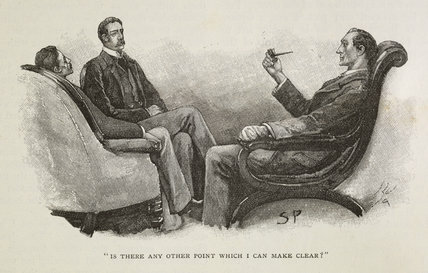 It also presented that both Holmes and Watson were aware of the Craft, which was popular amongst the late-Victorian middle-classes. ‘Whose was it? His who is gone. Who shall have it? He who will come. Where was the sun? Over the oak. Where was the shadow? Under the elm. How was it stepped? North by ten and by ten, east by five and by five, south by two and by two, west by one and by one, and so under. What shall we give for it? All that is ours. The location of the club in the story was given as being on Pall Mall, a short distance from the Carlton Club, Conan Doyle presenting its interior as having a games room and ‘a large and luxurious’ reading room. The ‘Diogenes Club’ was fictional, but with Mycroft’s secretive career in government, the club was presented as having a possible deeper and overall mysterious political agenda. Conan Doyle certainly used references of Freemasonry to add a further texture of mystery and secrecy to his works, the Craft clearly inspiring him to add these references. During the time Conan Doyle was writing his Sherlock Holmes stories, Freemasonry was becoming extremely popular with middle-class males, and to add a touch of Masonic flavouring to his stories would of course appeal. The character of Sherlock Holmes knew about Freemasonry; he knew its signs and symbols but wasn’t a Mason himself, and therefore his knowledge of Masonry adds to the somewhat mysterious persona of Holmes, creating an extra layer to his character.